The savory and sweet goodness that this delicious vittle can offer. Salt flecked toffee? Are you serious? Oh, yes. I am. After some email inquiries about this divine treat after my Fleur de Hell post, I am sharing the recipe. I know some of you have commented that my recipes are a bit on the difficult side. This one looks (and tastes) much more difficult than it is. Thanks Martha Stewart. And this recipe got rave reviews at my office (since I dropped the Fleur de Sel AFTER I used what I needed for this recipe.) Buon Appetito! Coat a rimmed baking sheet with cooking spray. Bring butter, sugar, water, and corn syrup to a boil in a large saucepan, whisking frequently until sugar dissolves and butter melts. Cook, undisturbed, until mixture registers 300 degrees on a candy thermometer, about 12 minutes. (You can easily use a meat thermometer too). Whisk toffee mixture, then immediately pour onto prepared sheet, tilting pan to spread over entire surface. Let stand for 30 seconds, then sprinkle with fleur de sel. Let cool. (Do not move the pan for first 30 minutes.) Break toffee into pieces. Toffee will keep, covered, for up to 1 week. Sweet and savory - yummmmmmmmmmmmmmmmm! Any recipe in which the key ingredients are butter and sugar works for me! I'm going to give it to all my skinny friends at the gym! I'll take any competitive edge I can get. See how I am?? Love the packaging. Did you make that? Can't remember when I last toffeed it for dessert. Thanks for this! This rocks. I am making this. Tonight. Won't I be popular? Sooooo, what you are saying is that this is a low calorie dish? Oh yea, one more question. Did you use Fluer de sel, per se, or did you just toss on some table salt? Oh my gosh, I think I just drooled on my keyboard!!! You may need to have a blog giveaway and "conveniently" pull my name!! I came over from TalesOfExtraordinaryOrdinareness, Susan's blog, here for a cocktail after her sad story, and taking in all that you have provided, I have to say, this is a neat treat. Thanks for stopping by my place lady! Cute blog!! !Call me newly addicted! Happy Saturday Sharefest to you too! O.M.G. This looks so yummy! I love toffe, and I've been dying to try Fleur De Sel. If only I knew where to find it...thanks for sharing this! Man that looks so good!! I've never made toffee before, and this looks like something my mom and I would enjoy trying to make together. She LOVES toffee! Happy SITS Sharefest Day! yum! perfect for halloween treats! 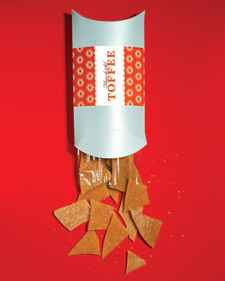 Ilove toffee!! gotta try it for the holidays! How am I EVER going to saty on my diet with posts like this? Good thing it has more than 3 ingredients and the directions had more than 2 steps. I'm out. Can't do it. Don't mind if I do. YUM! I am so nuts about toffee! Thanks for the recipe. Hugs!! Oh, I love sweet and salty together. This is a little more sophisticated than chocolate covered pretzels! Sounds delicious. Can I live with you? I've never taken to the sweet/salty combo - I like my salty foods salty, my sweet foods sweet, period. Here's to JennyMac single handedly stopping me from fitting into the jeans I hate the least. Wow, that does sound great, I'll try it when I get back home. Last week, I was in Lugano, Switzerland, and bought more chocolate that Willie Wonka's pimp, so I might have to work through that a bit first (and give some away). "butter, sugar, and corn syrup"...Come to Papa! MMmm sounds so good! I also just got some French grey sea salt a few weeks ago - I think I would cry if I dropped it. That sounds AMAZING!! Wonder if it has medicinal properties? Worth a shot, I suppose. Thanks for sharing. But you left out the part about how best to scrap it off the floor! Okay. A couple of questions. Should the sheet be a cookie sheet or a pyrex? Greased or ungreased? And if we can get this special "le fleur" salt, would kosher work as a substitute? Can you tell I'm determined to make this toffee and can't cook for sh-t? Hi L.M.M: I would use a rimmed cookie sheet. Although you could use a 9x13 pyrex, it will just be thicker. You can also 1/2 the recipe and only spread it in half the pan. Grease the pan for sure. And I think Kosher salt would work, only giving it a slightly different salty hue. PS: All, I would NOT recommend regular table salt. Damn you, fleur de sel!! Just kidding, I'm just jealous. It looks divine. Something for you at SFA when the next post goes up.